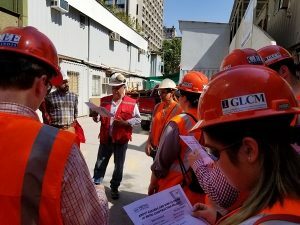 This afternoon the global leaders visited the Metro Expansion Project which is still under construction by Metro de Santiago. Metro is owned by the Public Authority of Chile and is a very important mode of transportation for the residents of Santiago. Out of 7.3 million people, 4.2 million rely on public transport every day. 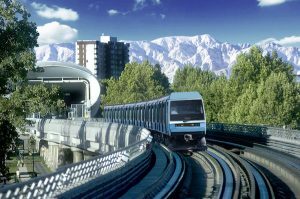 Santiago serves as the most ideal source for metro due to its spread-out terrain and good geological conditions. 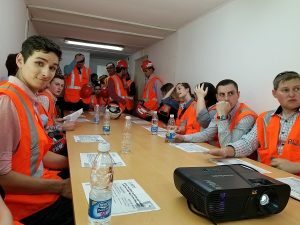 The visit was accompanied by a series of event including: brief oversight of the project, safety instructions, and site visit. 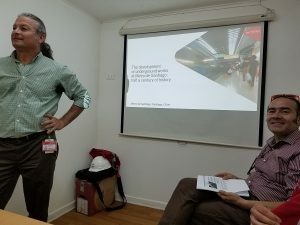 The presentation about the Metro program was given by Mr. Jose Roberto Herrera – Chief of Metro de Santiago and Department of Public Transportation (DOT). He gave a brief history about the metro construction in Santiago. 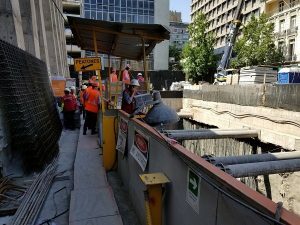 The metro construction started in 1960 which involved the construction of 5 lines and 108 stations serving 103 km.Earthquake is one of the most important reasons which needs to be accounted for while doing any construction in Chile. It is because the city is surrounded by Nasca plates which are very unstable and tend to possess high earthquake risks. The worst earthquake disaster was recorded in 1960 in Valdivia which was a 9.5 on a Richter scale. 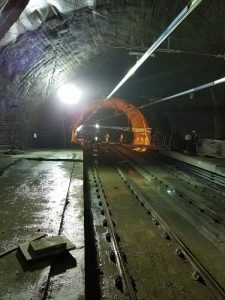 As Santiago is located between Coastal&Andes mountain ranges, its geological conditions consist of mainly gravels and soft soil which needs to be accounted in all tunnel designs. The metro construction project was built in different stages. The first stage involved the construction of two lines: L1 & L2 build between 1967-1987. The tunnel and stations were constructed by cut and cover method. However, this method was not suitable as it had a very bad impact on the surface due to high volumes of excavation. The second stage involved the construction of line L5 (1993-2000). The stations were built by cut & cover method using piles, struts, and anchors while tunnel was built by New Austin Tunnel Method (NATM). NATM was based on the capacity of soil to take support which was generated during excavation. 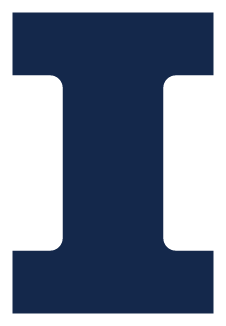 It involved three sequences: top heading, bank, and invert which helped in redistributing internal efforts of soil. The third stage was the construction of lines L4, extension of L1, L2, and L5. In this stage, NATM was used for both tunnel and station construction. 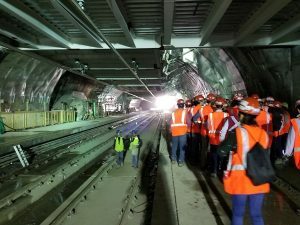 The most recent construction in the expansion of metro project is the fourth stage which involves the construction of lines L6 & L3 and two new subway stations. Its estimated completion is 2021 and is worth $1 billion. This stage incorporates all new construction sequences. 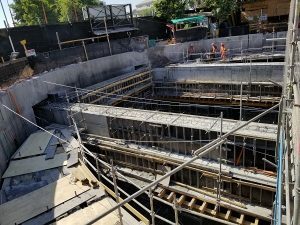 Both the stations and running tunnels are built by underground method in which excavation is performed in a circular shape of diameter 25 m instead of conventional rectangular excavation. 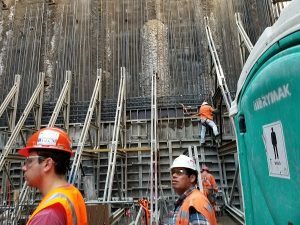 The new construction techniques also involve shorcreting on tunnel walls by machines instead of manual manpower. The shortcreting is done in two layers i.e. primary and final layer. Both the layers are reinforced with bars and steel mesh to provide additional strength and prevent any cave in. Additionally, the length and gap of invert excavation was also increased from eight to twelve steps. 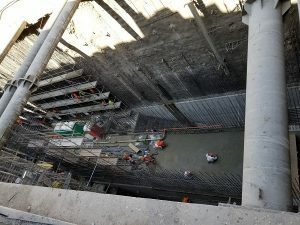 The most astonishing facts about Santiago’s metro is that, it is the cheapest metro in the world with the cost per km less than $90 million including design, construction, trains, and workshops. There is also an addition of a bonus track line L7 which is in its design stage right now. Its estimated completion is 2026 and it will serve 25km and will have 19 stations.